MINI owners in Buckinghamshire who found a man with a tape measure taking their cars' vital statistics might like to know that this apparently peculiar activity got him into the Guinness Book of Records. The measurer was Perry Watkins, who wanted to build the world's lowest Mini. This might seem like an odd ambition, except that Perry was co-respondent for the world's lowest Hillman Imp, a pink, compressed thing, which at 26.5 inches high has been a Guinness Book of Records inductee since the early 1990s. 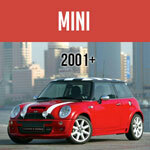 Perry built his Mini, and at 23 inches it manages to undercut its predecessor by 3.5 inches. Such things are meat and drink to a man whose previous efforts included a giant, Mini-based Dalek and a lavatory on wheels powered by a car starter motor. This device very publicly bucked him off at a custom car meeting, resulting severe gravel rash, a trip to the St John's Ambulance medics and the priceless exchange: "What happened to you?" "I fell off the toilet." Given these automotive proclivities, building a very low Mini starts to make more sense, but Perry wanted to make sure it was viable before starting. "I need to find something interesting if it's going to take years to build, so I spent 18 months measuring Minis and Rover V8 engines." 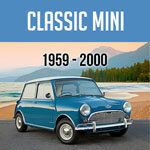 Yes, Perry wanted his knee-high Mini to be powered by a 3.5-litre V8, which in standard form was 23 inches high. He chopped 2.5 inches out of the sump, relocating the oil pick-up pipe, removed the bottom of the transmission bell housing, redesigned the exhaust manifolds and chopped a lump out of the Holly carburettor's neck. Having compressed the engine, he then set about building a 14ft-long body. "I bought a Mini Mayfair shell for £100, worked out where I was going to cut it to leave 23 inches and got out my nine-inch angle grinder," he says. A scrapyard's worth of other dead Minis were used to patchwork the body together. The roof alone was made from 29 sections and the whole thing gobbled up 49 kilos of filler. This long, vehicular extrusion was used as a template to make a box section chassis, in the middle of which sat the engine because, Perry explained, you wouldn't be able to see over it otherwise. The end product sits barely an inch off the ground, so hydraulic rams lift it's sausage-dog underbelly to avoid painful contact with sleeping policemen and bumps in the road. After detaching a couple of stout clips, two further rams can lift the body clear of the chassis to allow its underpinnings to be fiddled with and maintained. Perry's Mini has specially fabricated front suspension crammed into a 9in-high space and a Jaguar differential at the rear with bespoke drive shafts, which cost £200 a time - he got through three sets before they worked properly. After several deep breaths, it was tested for the first time on a redundant airfield. "I didn't know what it was going to do," says Watkins. Once running, it met its creator's expectations, although with a turning circle pushing 100 feet, it wasn't very Mini-like. It's fairly frightening to drive with all that power. A bit of a roller-skate. Once you get going, it's very windy. "The air gets compressed as it comes over the bonnet," says Perry, with an evil grin. Given the time it took him to create his not-Mini, it isn't surprising that sons Daniel, 12, and Jack, eight, viewed it with disinterest until it finally rumbled into life (they like it now). A deal was also struck with his wife, Angie: if Saturdays were given over to Mini chopping, then Sundays were for family things; a good method of avoiding domestic violence or car widow's curse. So having got a very low, very long Mini out of his system, what next? "I'm not a low-car fetishist," says Perry, before talking dreamily of a coffin with handlebars. "And I quite fancy putting an engine in a caravan and towing a Reliant Robin backwards, with a mannequin looking out of the driver's window as if he's reversing."